Roasted Cauliflower is a healthy, quick and easy dinner side that takes minimal effort to prepare and is huge on flavor and versatility. 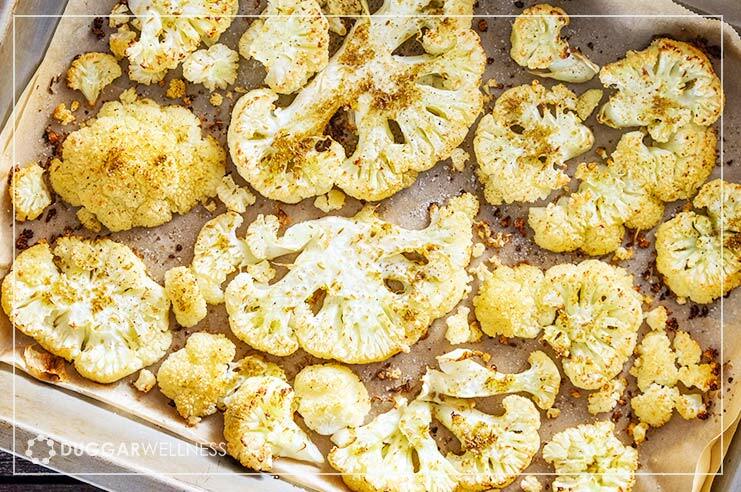 Roasted Cauliflower can be prepared with any of your favorite seasonings. You can make basic roasted cauliflower with just a little sea salt, parmesan roasted cauliflower or our favorite spiced roasted cauliflower recipe below. Any way you serve this easy Roasted Cauliflower recipe, you will have a crave-worthy winner full of fiber, antioxidants, vitamins and minerals! Cut your cauliflower into florets. The smaller the floret, the faster they will cook. Place in a glass casserole dish or parchment lined baking sheet. Pour oil over the cauliflower, sprinkle on seasonings. Toss gently. Roast for about 25 -30 minutes, until the cauliflower is tender and caramelizing along the edges. Try the same instructions for roasted broccoli.